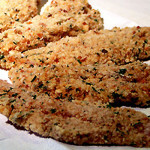 Chicken Inner Filets Breaded & Pan Fried – Here I use homemade Italian flavored bread crumbs and serve this with lemon wedges and a flavored mayonnaise. They are good for this recipe or gently sauteed for salads or stir fried in Chinese dishes. When you buy packages of chicken breasts they often have the little inner filet still attached.